Looking for the perfect venue for your next social gathering, wedding reception, or corporate event? Whether in the company of colleagues or clients, friends or family - we've lined up the best locales for every occasion and atmosphere. Experience a favorite with foodies from around the world at Sage, where James Beard Award-winning Chef Shawn McClain curates a fresh, ever-changing menu of contemporary American cuisine with global influences. With artisanal meats, sustainable seafood and farm-to-table produce, it’s simply impossible to go wrong here. Sage dresses up the freshest seasonal ingredients and transforms them into tempting culinary creations that take your taste buds on an adventure of their own. Capacity: 112 main dining room seats, 49 lounge seats, and 55-seat semi-private area. Prepare to be reintroduced to classic French cuisine with a twist only Chef Michael Mina could dream up. The menu features iconic French comfort foods paired with an array of both New World and Old World Wines. The design and atmosphere is sure to add a little “je ne sais quoi” to your event. Capacity: 45 private dining room seats. Momofuku draws influence from all over the world, beautifully blending flavours from the United States, Korea and Japan into dishes that are simultaneously tasty and artsy. The menu features fantastic sharing dishes including steamed buns, noodles, and seafood. There are also various plays on classics, like their take on surf-and-turf featuring fried chicken and caviar. Capacity: Semi-private dining room for up to 36 guests. If you are craving Kobe A5, arguably the best beef in the world, Jean Georges has it. But, the offerings extend far beyond a simple steak. Three different types of beef from around the world, dozens of cuts and a selection of seafood and unique sides - there is something for everyone, as long as everyone is looking for the best of the best. Capacity: 266 total seats, 192 dining room seats, 65-seat semi-private area, 20-seat Boardroom, 38 Wine Alcove seats, and a 12-seat Chef’s table. This celebrated concept pays homage to the Italian-American restaurants of the mid-20th century – an era of glamour, showmanship and tableside service. The New York-inspired cuisine is influenced by that same time in history, but takes its culinary cues from the great talents and techniques of today showcasing elevated classics such as Lobster Fra Diavolo, Chicken Scarpariello, Veal Parmesan and Octopus Pizzaiolo. Hand-shaken margaritas? Check. Ceviche and enchiladas? Check. A selection of the world’s finest tequilas? Check. At Javier's you’ll find all the makings for an upscale yet approachable, authentic Mexican dining experience, all while surrounded by unique Aztec decor and motifs. 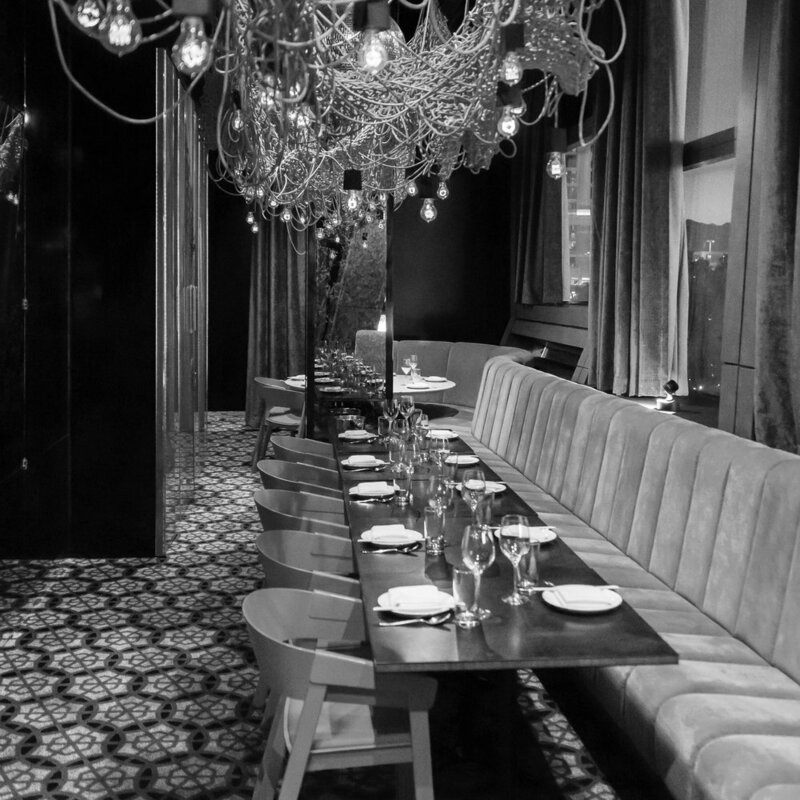 Capacity: Semi-private dining area seating up to 28 people. Milos offers stunning dining spaces featuring classy Greek charm. The Wine Room is intimate and sophisticated, seating up to 30, and displaying the extensive wine collection. The Luxury Room's floor to ceiling windows floods it with natural light by day, sweeping views of the Strip by night, and seats up to 40. For groups up to 100, it can open up to the Garden Terrace, overlooking the Strip and filled with lush greenery, for up to 70. The elegant Main Dining Room seats up to 160, or can be sectioned into smaller semi-private dining spaces. Milos Lounge is a vibrant spot for a cocktail reception. Capacity: Many options for group sizes from 30 to 160 guests. Marquee is a multi-level club venue and stylish location for corporate functions, holiday receptions, product launches, and networking receptions. The outdoor rooftop pool deck features 10 bungalow cabanas & eight grand cabanas, two island bars, and DJ Booth. The club features a $5 million state of the art stage, audio, lighting and video package. The in-house Chef & Culinary Team offer up a full range of food services, from passed hors d’oeuvres to buffet style dining and beverage packages. Capacity: Host events up to 4,000 people. Hakkasan is an immersive 80,000-square-foot, five-level space that offers a variety of environments, including the restaurant, private dining room, Ling Ling Lounge Club, Main Nightclub, Pavilion and Mezzanine. This exceptional concept also showcases a unique convergence of world-class mixology and musical talent. Offering four distinct nightlife experiences, combined with two stories of dining decadence, Hakkasan has the ability to accommodate any type of private event. The various levels and atmospheres provide the unique flexibility to connect spaces, or keep them separate, based on your needs. XS, the provocative new Nightclub at Encore, is the ultimate in sensual sophistication to host your next affair. The lush, shimmering finishes, meticulously planned sound system and surreal, 3D imagery combine to create a fantasy of sight, sound and touch. Outdoor seating offers an up-close view of the exotic, European Pool, which glows and comes to life after dark. The poolside ambiance mingles with the nightclub's decadent vibe to create an exclusive oasis. For VIP guests there are 26 lavishly appointed private cabanas offering voyeuristic views of the Nightclub life below. This unique environment adds a wonderful twist to the club atmosphere, re-defining the adult night life experience.